So, every month my office has a luncheon for birthday’s and today’s theme was something ‘green’, because of St. Patrick’s Day! I was super excited, because this meant I had a reason to bring guacamole and my faaaavvoooooooorite, plantain chips! Yes, I am making this at my desk. I pre-cut all of the ingredients, except for the avocadoes, the night before and then bought all the essentials to work. 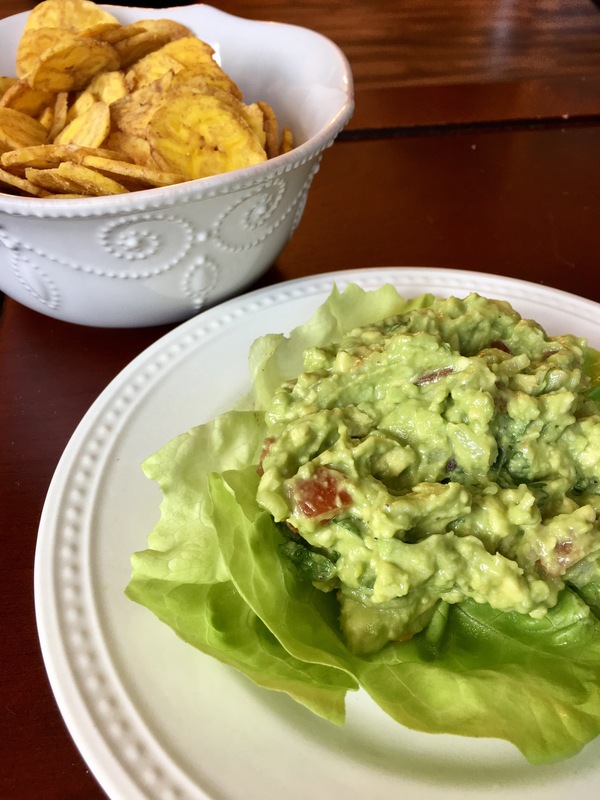 I waited to cut the avocadoes until I was ready to serve, to keep the guacamole fresh, but the lime juice that you add does an okay job at keeping the avocado from oxidizing. I also made my plantain chips at home and sealed them in an air tight zip lock back to preserve the freshness. If you can, make these the morning of. They are really fast and effortless to make. My mouth is already watering so let’s get to it! Slice the avocados long ways and using a large chef knife, stab the seed twisting till it loosens up and can be removed. Slice the avocados long ways with in the skin and using a spoon, scoop the meat out into a bowl. Using a fork, mash the avocados together. It’s okay for it to be a little chunky! Stir in the other ingredients and squeeze the juice of half of a lime in it. Depending on your taste, you can add the other half. Serve right away with some fresh Plantain chips or store in an air tight container! Fitness has always been in my life since I was a little girl, but the "health" concept is a new development. I use to be that girl that could eat a whole pizza and not gain 15 pounds, and I though as long as I worked out hard I could eat whatever I wanted! Well, my mental and physical state said differently. Even though I didn't look "overweight" my gut, brain, and other organs were crying for help! The realization started, when I was 25 and I was drinking 3-4 cups of coffee a day, crashing at 3 pm, and then fighting falling asleep behind the wheel on my drive home from work. I longed for the days where I had so much energy and I would wake up starving! I no longer had this and I refused to believe it's just a part of "getting older". To hear more about my journey go to "My Story" under the "About" tab.